One of the most common reasons why a garage door breaks down is a lack of regular professional maintenance. Without proper care and attention, your overhead door system will develop issues over time, and if these aren’t addressed they can lead to complex problems rather quickly. As part of maximizing your door system’s service life, most manufacturers recommend scheduling regular maintenance appointments. Arranging time for professional technicians to inspect and care for your door helps prevent all sorts of problems down the line, which can save you the hassle, expenses and inconvenience of having to deal with a malfunction door. As part of a regular service appointment, our technicians will examine the condition of all sorts of load baring parts and make sure they aren't getting ready to break. We know what to look for, and we'll carefully examine your door for moving parts that require lubrication, like the hinges and the rollers, and signs of damage to the cables and the track. We'll also test the tension of the springs and make sure it is well adjusted and that they aren't overstraining. Once our team has finished working on your door, we'll perform a thorough set of tests. These ensure that your system is working perfectly once again, and that any small final problems are caught - we make sure that your door moves smoothly and freely before calling a job done. A key aspect of this stage is the opener safety sensors. These photo-electric eyes need to be positioned correctly in order to be able to adequately detect an obstacle. If we find that they need to be realigned, we'll carefully adjust their position and test the door to make sure it reverses properly. 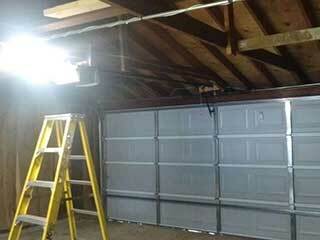 Good garage door maintenance makes a world of difference. Our expert technicians at Garage Door Repair San Tan Valley are ready to provide you with a service routine that will keep your system working smoothly and reliably year after year. Simply contact us today and schedule an appointment.